This morning I attended Southface’s Sustainable Atlanta Roundtable, which was focused on the concept of “Tactical Urbanism” in Atlanta. For the uninitiated, tactical urbanism is the practice of temporarily reclaiming urban spaces dedicated to cars (i.e. parking lots, roads, street parking, etc.) and repurposing that space for other, more enjoyment-oriented uses instead. For instance, taking one lane of a multi-lane road in a neighborhood and converting it into a bike lane with potted plants as barriers, or turning the space into a popup coffee shop, or temporary plaza, or something else entirely. The purpose is to take the space back from cars and make it open to the public to enjoy, even if only for an afternoon. The Atlanta Regional Commission (ARC), Central Atlanta Progress, Inc.’s Jennifer Ball, Atlanta Bicycle Coalition’s Rebecca Serna, and Matthew Garbett, along with other representatives from the community and local government, were on hand to discuss how they have applied the principles of tactical urbanism in the Sweet Auburn of Downtown Atlanta and other parts of the city the past few years. 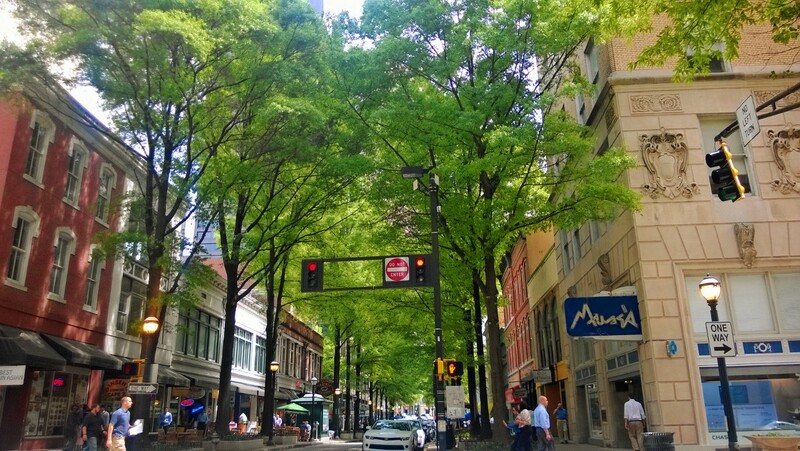 Broad Street in Downtown Atlanta. Last year, these different groups led by the Atlanta Regional Commission collaborated to turn the Sweet Auburn neighborhood into a walkable community with the “Sweet Auburn Living Beyond Expectations” project. The ARC accomplished this by filling vacant retail spaces with popup shops, hosting popup coffee and food shops, sectioning off portions of the roads for bicycle lanes and mixed uses. The event mimicked (to an extent) the Atlanta Streets Alive events organized by the Atlanta Bicycle Coalition, which celebrates its fifth year of these events this year in the West End on April 19th and in Virginia Highlands on September 27th. During these events, the ABC shuts down three to six miles of roads to car traffic, hosts food and beverage vendors, and gives local artists and musicians a chance to strut their stuff. 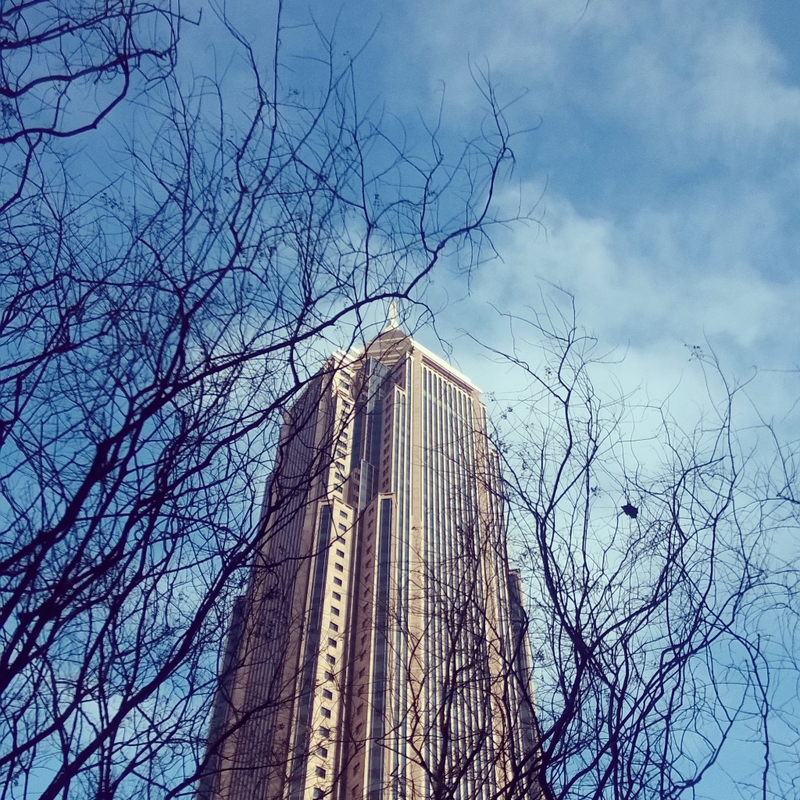 According to Rebecca Serna, the last Atlanta Streets Alive had over 106,000 people come out,” with over 130,000 people participating in 2014 alone. The longevity of tactical urbanism isn’t necessarily the point though. “Those experiences are so much more compelling [than just the physical changes],” Jennifer Ball of Central Atlanta Progress says. Garbett reinforces this point, that showing Atlantans that not only can urban spaces have multiple uses aside from being arteries for traffic, but that they can transform those spaces themselves, is the most important thing. “I think that once more people see this kind of stuff and see that people aren’t going to jail for it, they’ll start doing it as well,” he says. As the roundtable wrapped up, the conversation turned towards safety of biking and walking in the city. Robert Reed, Communities Design Director at Southface, asked the audience, “How many of you have been hit by a car, either while biking or walking?” At least a third, maybe half of the people in attendance raised their hands, including myself. And with multiple instances from just the past few weeks of pedestrians being killed on Atlanta roads, the issue of safety is far from being resolved. If you can, come out to the next Streets Alive event. Let’s top last year’s 130,000 record and really show everyone how great this city can be.